You wake up in the morning feeling a little down, but not sure why. You love your life, but for some reason you have a hard time pulling yourself out of bed. 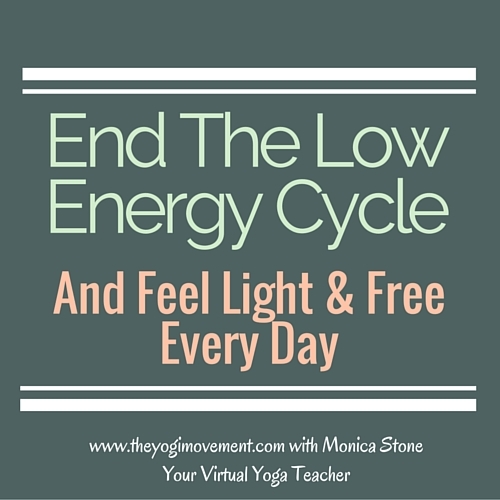 Even though you’re happy and healthy, you just feel tired and low energy all frickin’ day. I’ve been there & I SO got your covered! I just spent a whole year of my life like that. Actually, It started when I was working at my corporate job about nine years ago. I thought it would all go away after I left, but it lingered for another 12 months. I was having such resistance to my yoga mat. My intentions were always there, but I was only making it a few times a week, and most of the time I couldn’t get past Sun Salutations. Whenever I practiced, I couldn’t help but realize how heavy I felt, and that I was hurting in my body. I just committed every day to remain unattached, and return to the mat. I would fight with myself, too. What’s the big deal? Why cannot I not just roll out the mat? Why is this so hard? Why do I procrastinate? Another day would go by, and I’d just be angry and disappointed at myself. I tried to think back to the last time I had energy and felt good in my body, and there are two times I can remember. One was when I became vegan and started doing yoga. The second time was when I traveled to Joshua Tree and Carlsbad. That’s the most freedom I’ve ever felt in my soul. At that moment, I made it my mission to always live like that in my heart, and recreate that feeling no mattter what. The past three months have been a noticeable shift. I am going to share with you the top 7 things that worked for me in just a second, but I want to remind you that nothing happens overnight. You have to wake up every day excited to make these changes, and then stick to your commitments. In a world of an instant gratification mindset, that can be tough. But, if you want it bad enough – you can do it. Get Outside: I notice that the more time I spend outside, the more energy I have. My favorite activities are taking my yoga mat in the shade, walking around my neighborhood, or bringing lunch to a park and setting up a picnic. Nothing beats absorbing the energy of the sun, and watching the beauty of nature. It will give you clarity, make you feel free inside, and leave you feeling energetic. I can just sit there and watch the squirrels play, the birds sing, and the ducks swim for hours. Try it! Drink Water: I certainly wasn’t drinking enough water. I was drinking a ton of hot tea, but I really needed some fresh clear water. Ayurveda says that you shouldn’t drink really cold water with ice, which I agree. It shocks the system and slows digestion. I did chill my water a little because it’s been so hot here in Florida. After some research, I found out that lack of water can cause low energy, fatigue, poor complexion, and poor digestion. This change immediately made me feel more refreshed and alive. Is this the one thing you’re missing, too? Raise Your Heart Rate: I have been so dedicated to my yoga practice, and didn’t think I needed regular cardio. Even though Ashtanga Yoga is a rigorous and sweaty practice, it’s not the same as exercise. It’s a moving meditation, and you’re doing the same thing over and over. With exercise, you’re supposed to change things up so you won’t plateau. Now, I do mini exercises to bring my heart rate up, and wake up my body. For the longest time, I didn’t exercise because I thought it would effect how deep I could go in postures, but this has actually deepened them to where I’m now doing postures now that I was stuck in for years! This also reignited my passion for my practice, and skyrocketed my energy, so I’m not looking back! Do a Detox: The feeling of low energy could be from a number of things, but you should have some idea why you’re out of balance. Are you depressed? Are you drinking too much alochol? Not eating right? Working in a job you hate? 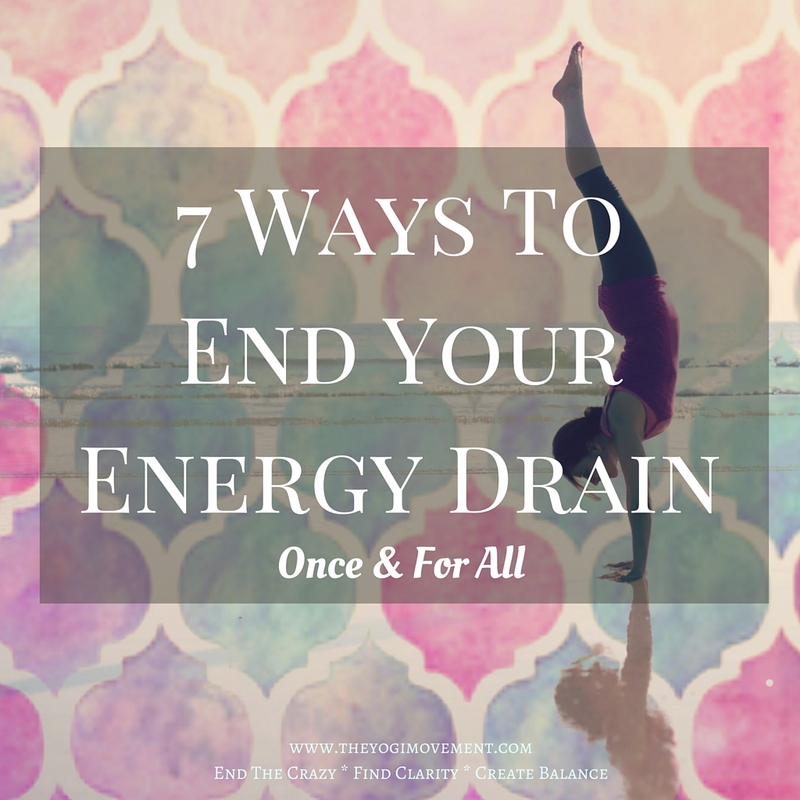 These are just a few aspects that can cause low energy, and a detox is sure to help. I took a course at the YMCA a few years ago called Body Transformation. We had to choose one thing to change over 30 days. I chose no alcohol (I was in college at the time). Everyone thought I was crazy, but I felt better than ever. It was also empowering to see how much discipline I had, and that I could go to a bar and still have fun without a drink in my hand. Right now, I’m doing a coffee fast for 10 days which is ironically giving me tons more energy. Try a juice fast, vegetarian for 30 days, social media fast – you name it. Pranayama: There are a ton of pranayamas that you can do, but my favorite is alternate nostril breathing. You know how you’re either considered a left or right brained person? Well, each side of the body has an effect on our energies and emotions, and one is always more dominant than the other. Breathing through the left nostril activates the Ida nerve ending, which relates to calmness and relaxation, and is considered moon energy. Breathing through the right nostril activates the Pingala nerve ending, which relates to alertness and activity, and is considered sun energy. Alternate nostril breathing helps to bring everything back to balance, and is also a way to meditate. You can learn more about it here! Clean: When my place or car is not clean, then my life feels like that too. In fact, maybe my life is like that first, and then my home and car end up that way. The best way to get out of the mess is to clean it. Be the change you wish to see – literally. If you’re feeling scattered and overwhelmed, then deep clean, and make an effort to keep things clean. This will help you feel lighter and freer instantly! I found out through my scrum journal that cleaning in the evening was holding me back, so I clean first thing in the morning so that I can be productive throughout the day. If you feel like you’re already a clean person, choose something to deep clean like your refrigerator, kitchen cabinets, or closet. Do Things You Love: This one seems easy, but it’s actually pretty tricky. We’ve been conditioned all of our lives to impress others. Something or someone in our childhood told us this is just how life works, so you believed it. Why wouldn’t you? Or, maybe you were always told that you needed to pay your dues, or do this or that to get ahead in life. I remember when I was looking for my first job someone told me to never call in sick, and to let the boss notice, and send me home instead. I was always told to go the extra mile, but what I ended up doing was overcommitting, being undervalued, and getting burnt out. (My boss actually asked me to work from home and not clock in. True story. I said no.). The truth is that you need to let go of what isn’t serving you, and just do what you love. Take a second to evaluate why you do what you do. What’s causing you stress, overwhelm, or depression? Always ask yourself if what you’re doing lights you up inside. That’s how I know what I need to cut it out of my life. It can be scary, but you need to really listen to your heart, and not the opinions of others. Don’t confuse fear for intuition. How did I come up with this plan? Sheltering myself at home in front of a computer burnt me out. I was feeling tired and dehydrated, so I added more water to my life. I was honestly feeling tired if I walked up too many stairs, so I knew something was wrong. I am a strong girl, but something was off with my stamina and endurance. I realized that I needed to add some exercise and bring up my heart rate to sustain me. When my place is a mess, I feel blah. But, when it’s clean I always feel free and light. I was taking on jobs that I didn’t want to do for extra money. This was causing me stress, so instead I took a bridge job for side money. That way I don’t have to chase money, and I can build my business just focused on doing what I love. That’s how I came up with these aspects to raise my energy. I’m sure that a few of the things I mentioned, you already do. Just choose one of them. Choose the one that you think could help you the most and schedule it into your life. After I came back from my low energy state, I evaluated why I felt like that for so long after I left my job. I mean, I was doing what I loved, making amazing life changes, and on the path to success. Then, it dawned on me – I was in a terrible space for the last 8 years of my life. I had to retrain my mind, retrain my body, and realize that most of the people in this world are good people. It took me awhile to let go of the negativity. You have to stick with it. You have to trust that you’re on your way to feeling amazing. The law of circulation says to start living the life you want before you’ve hit your goals. If you want a life full of energy, balance, and abundance, then you have to create the environment that goes with it. What kind of people do you envision a happy person spending time with? Where do they live? What’s their day like? What kinds of hobbies do they have? How often do they travel? Commit to creating this life, and the universe will reward you. I’m thrilled to say, I am back to my daily practice. I am finally making healthy food choices. I surrounded myself with supportive and loving people. My business is growing and I feel abundant! Tell me in the comments how you are bringing yourself back to balance. What are you doing to raise your energy? Let’s keep the list going! « Dream It Real This Year: Setting Untraditional Resolutions That Actually Stick!